You’ve been there before: you come to a website in search of relevant content, only to be greeted by ads that explode in your face. To add insult to injury, they are often completely divorced from the general theme of the website or the content you are looking for. Think of visiting an automobile site only to be presented with cheap tooth extraction surgery ads. You can avoid making your visitors go through the same ordeal by using interstitial ads on your website. Read on to learn more how the correct placement and application of measure and strategy in their use can offer you excellent conversion performance and improve your audience’s engagement. Less Intrusive, Yet More Visible? First of all, let us establish the difference between interstitial ads and other well-known formats such as banners or pop-ups. Interstitial ads are placed between two content pages and usually occupy full screen or a significant portion of it. Thanks to this, they manage to keep the visitor’s attention which often translates into a higher engagement performance. They show large size images during the transition in the user’s interaction with content, offering higher than average levels of visibility. However, size is not the defining feature of these ads, but rather the timing of their delivery. One of the key advantages of interstitial ads is their ability to position themselves comfortably at the center of your audience’s interaction with the content. As described, if your visitor’s experience is marred by being forced to view splash page ads even before having access to the content, they are bound to feel invaded and may even leave your site. Instead of this, interstitial ads are only shown following the initial interaction with your content. If your visitor, for example, finds your post useful, he/she may want to read another related article and be presented with an interstitial ad at this opportune moment. This is particularly important if you're going to establish a much desired contextual link between various items. Let’s imagine that you are running a sports-themed website, dealing with football news. Your visitors will know how to appreciate being served with sports apparel ads in between reading two articles about exploits of their favorite football club. Luckily for publishers, there is an integral solution for ensuring relevancy and contextuality of your ads, while fortifying your credibility and reputation at the same time. RevenueHits offers an effective monetization of your ad space (websites, toolbars, widgets and other assets) by serving relevant ads through geotargeted ad serving technology. To that effect, your webpage will not feature irrelevant advertisements that do not offer excellent performance, as RevenueHits uses advanced algorithms to research and determine the most efficient ways to place these ads with the goal of improving your marketing performance. This means that RevenueHits will offer you an inventory comprised only of contextually-aligned and high-performance ads that are relevant to your visitors, which helps you drive better traffic rates and profits. The success rate for your interstitial ads depends on the adequate timing and frequency of their placement. Their higher engagement rates relate primarily to them not being shown too frequently to avoid being perceived as intrusive. You can do this by showing moderation and not show the interstitial ad after each action that your visitor takes. According to Google itself, the best practice involves placing no more than one interstitial ad for every two actions taken by a user, either on a desktop or mobile platform. Similarly, you do not want to show two interstitial ads in consecutive order for the same purpose. Still, you are welcome to experiment with the frequency of these ads. The essential metrics for doing this are click-through rates (CTRs) and retention rates. It is one of the main selling points of interstitial ads, as they offer a high degree of flexibility in dealing with their timing or design. You can effortlessly enrich them by content that promotes engagement, such as attractive visuals, interactive polls, quizzes, etc. All of this proves that it is no wonder that interstitial ads secure high conversion rates, as the visitors who interact with them are converted to buyers more easily compared to others. This is even truer for some specific fields in the mobile advertising category in which these ads have a 5.6% conversion rate for businesses dealing with health & fitness. Still, your website can be dedicated literally to everything and interstitial ads will serve you equally well, provided that you find an adequate partner to provide you with them. With more than 20,000 publishers using their services, one can easily see why RevenueHits can offer you a turnkey advertising solution if you demand contextual, clean and strategically placed interstitial ads. 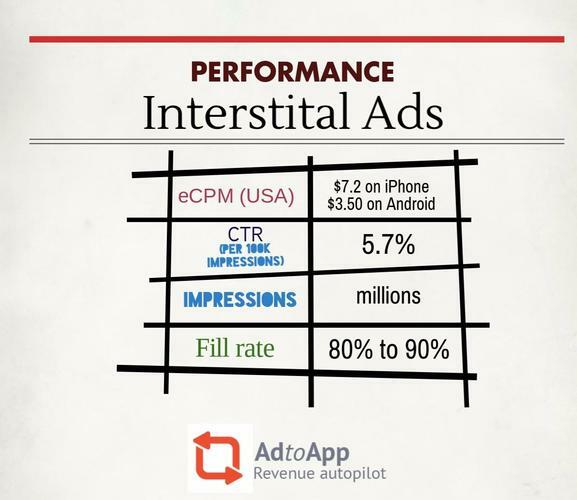 Interstitial ads have established themselves as a quality alternative to the ever popular banner or pop-up ads. Their main advantage lies in being less intrusive in the initial interaction your visitors have with their desired content. Instead of being greeted with aggressive ads even before they access the content, interstitial ads allow you to show them only after particular actions have been undertaken by your visitors. Their unobtrusiveness is a major advantage when you consider the new Google Chrome ad block, which was launched a couple of months ago to battle aggressive ad types. This makes this ad type a welcome addition to your efforts to promote the contextuality of your advertising, as you can place them on articles or posts that relate to the initial content your visitor has consumed. In addition to this, these ads offer a great deal of flexibility in terms of tweaking their timing and appearance, as well as combining them with other interactive content. If you are after higher conversion and engagement rates, this could easily become your advertising weapon of choice.